Is fluent in four languages: English, Spanish, Dutch and Papiamentu ... Signed by the Atlanta Braves as a non-drafted free agent on July 2, 2013... Signed by Dargello Lodowica. Hit .261 (167-for-639) with 40 doubles, 24 home runs, 105 runs scored, and 14 stolen bases in his first full season...He made the All-Star Game as a reserve, while his 69 extra-base hits were the third most by a middle infielder in franchise history...Marcus Giles had 72 in 2003, while Rogers Hornsby had 70 in 1928 ... Drove a 1-1, eighth-inning pitch out to left-center field to become the youngest player (21 years, 82 days) to homer on Opening Day since Washington's Bryce Harper hit two solo shots at the age of 20 years, 167 days to start 2013 ... This season marked Albies' first Opening Day appearance...The last younger player to homer in his Opening Day debut was the Braves' Jason Heyward (20 years, 239 days) in 2010 (Harper made his first Opening Day appearance in 2012 as a 19-year-old) ... Over the last 110 seasons, only two infielders younger than Albies homered on Opening Day, with both going on to make the Hall of Fame: Robin Yount (19 years, 204 days), who homered as a shortstop for Milwaukee to open 1975 and Orlando Cepeda, who homered at 20 years, 210 days as San Francisco's first baseman to start 1958 ... Set the franchise record for most extra-base hits (22) by the end of April and tied for the second most in MLB history...Finished one shy of Jermaine Dye's 2000 record ... Scored an N.L.-most 74 runs prior to the break, becoming the third player in franchise history to reach that mark before the All-Star Game... Tommy Holmes (1945) and Dale Murphy (1983) share the record of 76 runs ... Had 20 homers before the All-Star break, the most by a Braves batter since 2006, when Andruw Jones also had 20...Also had 29 doubles, tied for the most in franchise history prior to the break with Marcus Giles (2003)...His 52 first-half extra-base hits tied COL's Trevor Story for most in the league were the second most prior to the All-Star break in franchise history...The club record is 53 by Hank Aaron in 1959 ... Hit his first career grand slam, 5/10 at MIA, becoming the youngest Braves player (21 years, 123 days) to hit one since fellow Curaçao native Andruw Jones, 8/31/97 at BOS...Added his second on 6/12 vs. NYM ... Became the first Braves player with multiple grand slams in a season since 2012, when Brian McCann also had two... Became just the second second baseman in Atlanta franchise history with two grand slams in a season, joining Davey Johnson, who had two in 1973 ... He became the first player 21-years-old or younger to hit multiple grand slams in a season since 2000, when Adrián Beltré hit two for Los Angeles (NL) ... Since the end of World War II, seven other players hit multiple grand slams in a season at 21 or younger: Mickey Mantle (1952), Faye Throneberry (1952), Eddie Mathews (1953), Tony Conigliaro (1965), Ken Griffey Jr. (1991), Alex Rodríguez (1996) and Beltré (2000) ... Hit a home run from both sides of the plate on 7/11 vs. TOR for his first career multi-home run game...Became the sixth Braves player in franchise history to homer from both sides of the plate in a game, and the first since Nick Swisher on 8/22/15 at CHC ... Albies became the fifth player since World War II to homer from both sides of the plate in a game before his 22nd birthday... The last to do so was New York's José Reyes against the Braves on 8/28/03...St. Louis' Johnny Lucadello did it on 9/16/40 against the Yankees for the first two home runs of his career...Texas' Rubén Sierra (9/13/86 at MIN) and Baltimore's Eddie Murray (8/3/77 at OAK) also did it ... Hit .226 (53-for-234) with 11 doubles, two triples and four home runs in 65 games after the All-Star break ... Batted .333 (63-for-189) with eight home runs and a .900 OPS batting right-handed, and .231 (104-for-450) with a .691 OPS hitting lefty ... Started all four games of the NLDS vs. LAD, going 3-for-15 (.200). Opened 2017 ranked by MLB.com as the Atlanta Braves' No. 2 prospect, the No. 2 second base prospect in baseball, and No. 9 on the "Top 100 Prospects" list...Went on to make his major league debut on 8/1 vs LAD at the age of 20 years, 206 days... 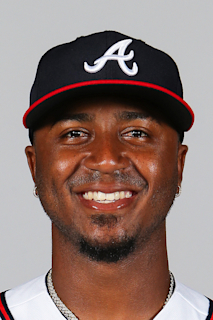 Became the youngest player to play for the Braves since RHP Julio Teheran also debuted as a 20-year-old in 2011...Ended the season as the second youngest player in MLB (Victor Robles, WSH)...Began his major league career hitting just .170 (8-for-47) during his first 14 games, before batting .318 (54-for-170) over his final 43 contests...His 62 hits from 8/1 through the end of the season were fourth most among MLB rookies... His first major league hit was a three-run home run off LAD's LHP Tony Cingrani in the ninth inning on 8/3…Became the first Braves player to homer for his first hit since Evan Gattis on 4/3/13 vs. PHI (off Roy Halladay)…Gattis did it in his second career at-bat…Albies' shot came in his eighth at-bat...At 20 years, 208 days, became the youngest Braves player to hit a homer since OF Andruw Jones in 1997...Jones and Albies are both from Curacao...Hit in 13 straight games, 9/2-15 (.340/.419/.547, 18-for-53)...It was the longest hitting streak for a Braves rookie since Freddie Freeman had a 20-game run in 2011...Tripled in Game 1 of a 9/6 doubleheader vs. TEX for his fifth triple in his 33rd game…The last major leaguer to have more than five triples through his first 33 games was Kansas City's Butch Davis, who had six in 1983...From his MLB debut through the end of the season, tied three other players for the MLB lead with five triples...Named Gwinnett's Player of the Year by the Braves, as well as Gwinnett' Co-Most Valuable Player for the 2017 team awards...Was selected to both the International League Mid-Season and Post-Season All-Star teams…Was also named an Atlanta Braves Organization All-Star by MiLB.com...In his second Triple-A season, batted a team-best .285 (117-for-411) among qualifying players in 97 games…Also led the club in hits (117), multi-hit games (30), triples (8), stolen bases (21) and runs scored (67)...His .285 average with Gwinnett ranked seventh in the International League and ninth among Braves farmhands…He also ranked among IL leaders in triples (T-1st, 8) and steals (T-7th, 21)...Tallied a minor-league career-high nine home runs with GWN, including four from the leadoff spot in the lineup...Posted a season-best 13-game hitting streak, 4/7-20…Batted .310 (18-for-58) with eight extra-base hits, seven RBI, six stolen bases and 10 runs in that span... Reached base safely in 24 consecutive games, 5/25-6/26…Had a .348 on-base percentage during this run...Named Gwinnett's Player of the Month for June by the Atlanta organization…Had a .312 (29-for-93) average with 11 of his 29 hits going for extra bases, 16 RBI, five stolen bases and 15 runs scored in 21 games...Started at second base and batted in the leadoff position for the International League during the Triple-A All-Star Game (7/12 at Tacoma)…Went 2-for-5 (.400) with one double and one run scored...Hit at a .307 (61-for-199) clip over his final 46 games, 6/1-7/31, at GWN…This mark ranked seventh in the IL in average...At the time of his MLB debut (8/1), ranked in the IL top 10 in hits (T-1st, 117), triples (T-1st, 8), runs (2nd, 67), total bases (3rd, 181), steals (5th, 21) and extra-base hits (T-7th, 38)... Posted a .973 fielding percentage (11 errors/415 total chances) in 96 games for GWN…Played in 82 games at second base and 14 at shortstop. Split the 2016 campaign between two different levels of Atlanta's farm system, playing in a combined 138 games between Double-A Mississippi and Triple-A Gwinnett…Produced a .292 (161-for-552) batting average with 33 doubles, 10 triples and 30 stolen bases between the two stops...Had a combined .358 on-base percentage with 83 runs scored…Played the entire season at the age of 19, making a total of 135 starts between second base (83) and shortstop (52) ... Batted .321 (106-for-330) in 82 games with Mississippi en route to claiming the Southern League (AA) Batting Title…Albies technically finished the season seven plate appearances shy of the required 378 plate appearances needed to qualify for the batting title, but per Rule 9.22 (a), those seven plate appearances were added to his stat line which resulted in a .315 (106-for-336) batting average, still tops in the league ... Played the first month of the season with Mississippi before a transfer to Gwinnett on 4/30...Remained with Gwinnett for two months before returning to Mississippi on 6/30…Upon his return to MIS, predominately played second base in effort to play alongside the Braves' top prospect SS Dansby Swanson ... Ranked in the top 10 among Braves farmhands in several offensive categories including stolen bases (3rd, 30), on-base percentage (T5th, .358), walks (T5th, 52), batting average (6th, .292) and OPS (7th, .778) ... Started Game 1 (9/7) of the Southern League South Division Series and went 0-for-2 before suffering a fractured olecranon in his right elbow during his sixth-inning at-bat...Underwent a surgical procedure to repair the fractured olecranon on 9/20...The procedure was performed by Dr. James Andrews in Gulf Breeze, Fla ... Entered 2016 as the Braves' No. 6 prospect as tabbed by Baseball America, as well as possessing the "Best Infield Arm" among Atlanta farmhands. Entered 2015 rated by Baseball America as Atlanta's seventh-best prospect and as having the system's "Best Infield Arm." ... Tabbed by Baseball America as the third-best prospect in the South Atlantic League at the season's conclusion ... Spent his first full professional season with Rome (A), where he garnered the club's Player of the Year honors and paced the team in runs (64), hits (122) and batting average (.310, minimum 250 at-bats) ... Earned both South Atlantic League Mid-Season and Postseason All-Star honors, and was named SAL Player of the Week for the period of 5/4-10 ... Ranked in the top 10 among Braves farmhands in several offensive categories, including batting average (4th, .310), runs (4th, 64), hits (T5th, 122), doubles (T9th, 21), triples (T3rd, 8), OPS (8th, .771) and stolen bases (4th, 29) ... Placed on the seven-day disabled list on 8/4 and missed the remainder of the season (33 games) due to a right thumb fracture ... Named the starting shortstop for the World Team during the Sirius XM All-Star Futures game (1-for-2). Started his professional career with the Gulf Coast League Braves before moving to rookie-level Danville on 7/19 ... Combined to hit .364 (72-for-198) with 22 steals across 57 games on his way to earning Danville's Player of the Year honors ... Ended his first professional season in the top 10 among all Braves prospects in batting average (1st, .364), on-base percentage (1st, .446), OPS (1st, .890), slugging percentage (5th, .444), and stolen bases (T-5th, 22) ... Tabbed by Baseball America as the top prospect in the Appalachian League and the third-best prospect in the GCL at the season's conclusion. August 1, 2017 Atlanta Braves selected the contract of 2B Ozzie Albies from Gwinnett Braves. June 13, 2017 Gwinnett Braves activated 2B Ozzie Albies from the 7-day disabled list. June 5, 2017 Gwinnett Braves placed 2B Ozzie Albies on the 7-day disabled list. April 4, 2017 2B Ozzie Albies assigned to Gwinnett Braves. January 25, 2017 Atlanta Braves invited non-roster 2B Ozzie Albies to spring training. September 30, 2016 Mississippi Braves activated 2B Ozzie Albies from the 7-day disabled list. September 8, 2016 Mississippi Braves placed 2B Ozzie Albies on the 7-day disabled list. June 30, 2016 2B Ozzie Albies assigned to Mississippi Braves from Gwinnett Braves. April 30, 2016 SS Ozzie Albies assigned to Gwinnett Braves from Mississippi Braves. April 4, 2016 SS Ozzie Albies assigned to Mississippi Braves from Rome Braves. January 7, 2016 Atlanta Braves invited non-roster SS Ozzie Albies to spring training. September 28, 2015 Rome Braves activated SS Ozzie Albies from the 7-day disabled list. August 5, 2015 Rome Braves placed SS Ozhaino Albies on the 7-day disabled list retroactive to August 3, 2015. July 14, 2015 Rome Braves activated SS Ozhaino Albies from the temporarily inactive list. July 11, 2015 Rome Braves placed SS Ozhaino Albies on the temporarily inactive list. April 6, 2015 SS Ozhaino Albies assigned to Rome Braves from Danville Braves. March 7, 2015 SS Ozhaino Albies assigned to Atlanta Braves. July 19, 2014 SS Ozhaino Albies assigned to Danville Braves from GCL Braves. July 8, 2014 SS Ozhaino Albies assigned to Danville Braves. May 30, 2014 SS Ozhaino Albies assigned to GCL Braves from DSL Braves. February 20, 2014 SS Ozhaino Albies assigned to DSL Braves. July 2, 2013 Atlanta Braves signed SS Ozhaino Albies.